Welcome to this adorable N/S facing 3 bedroom home in the very desirable community of Clemente Ranch. You will appreciate the designer paint colors throughout including the artistry on the kitchen wall. This home has upgraded carpet in all the right places. Enter into a light and bright living room adjacent to the private den. The family room and kitchen overlook the lovely extended covered patio and pristine fenced yard. Newer A/C, refrigerator, microwave and stove. The roof is being replaced June,2017. 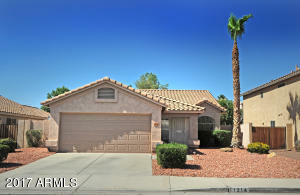 Close to award winning Chandler schools, parks, shopping and more! Inventory is low so don’t miss out on your opportunity to own this lovely home!